The valuation of SaaS companies is much higher than software product sales companies. 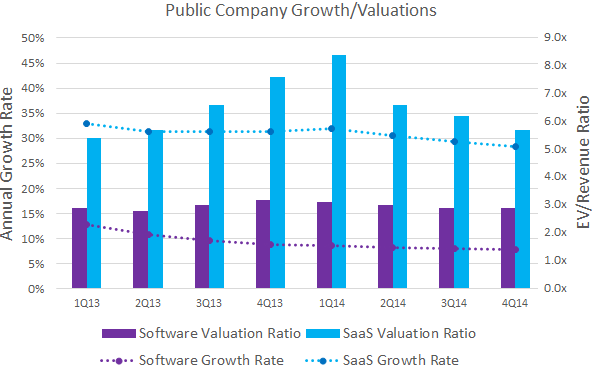 Public SaaS companies have an Enterprise Value to Revenue median ratio of 5.7x contrasted with 2.9x for software companies according to Software Equity Group’s 2015 Software Industry Financial Report. Do Investors love SaaS companies because they have higher valuations or do SaaS companies have higher valuations because Investors loves them? Well actually, this isn’t irrational exuberance. 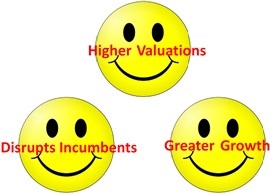 There are good reasons why SaaS companies have high valuations. The valuations are a result of the superior SaaS business model. The market has changed; customers want to rent rather than buy – CAPEX, not OPEX. They want the flexibility to try SaaS and then abandon them, use them, or expand them – business agility favors SaaS instead of software purchases. SaaS based companies take many forms. 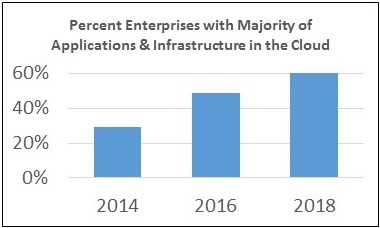 Software as a Service (SaaS) such as Salesforce and Infrastructure as a Service (IaaS) companies such as Amazon have seen the greatest growth, but there are many other SaaS industries such as telecom, Media such as Netflix, Healthcare, and even the “wine of the month club.” Companies with recurring subscription revenue are viewed favorably by the markets. SaaS provide convenience, flexibility, and less lock-in for customers. SaaS require less time and effort for implementation – reducing both the cost and the time to value (TTV) for customers. Customers see the benefits of SaaS creating market demand, which fuels the accelerated growth of SaaS companies. Legacy product vendors have an advantage in their resources, customers and partners. It takes a disruptive offering to capture these customers from the incumbents – a SaaS offering can provide that disruption with new capabilities, pricing models and delivery mechanisms with greater flexibility for customers. SaaS companies structurally can provide more rapid advances than product vendors. New capabilities can be provided in next month’s SaaS update with their customers benefiting from the most recent innovations quickly. The ability to provide new benefits faster to customers provides a competitive benefit to SaaS companies. These benefits allow SaaS companies to enter markets that were dominated by companies with a product sale mentality and compete successfully. Companies without a SaaS offering won’t get a seat at the table – SaaS is usually a requirement in new projects. Investors looks for companies that disrupt the status quo. And investors loves growth. The median growth for SaaS companies is over three times that of Software product companies. Consistent growth in revenue is followed by a growth in company value. SaaS is a disruptive paradigm which allows companies with a SaaS offering to grow rapidly at the expense of the incumbents. Investors realizes that SaaS companies are gaining market acceptance, and even preference, in most applications (such as CRM) and industries (such as health care). Markets once not believed viable for SaaS subscriptions (such as ERP) are now seeing high and growing demand. Investors wants to identify the new leaders in these emerging companies serving these new markets for their potentially high investment returns. While initial SaaS revenues are less than product sales, over the life of the customer, the recurring SaaS revenue value is higher than product sales. 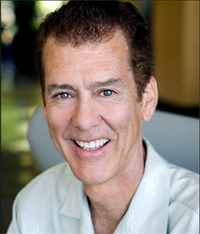 This greater customer value through a long term recurring revenue stream ultimately leads to greater company revenue. Investors value companies that are growing rapidly. High SaaS revenue growth is a result of expansion and retention of the customer base together with revenue from new customers. Software product companies must add more customers each quarter to grow, while SaaS companies just add customers on-top of the current base. Investors see the rapid growth of SaaS company valuations. For example, in the last five years, Salesforce, the largest cap SaaS stock, share price increase has been over double that of Microsoft, Oracle, or SAP, the three software companies with the highest market value. SaaS companies benefit from Moore’s law – their Cost of Service for the SaaS companies is decreasing year after year as public cloud costs fall. 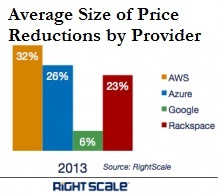 Amazon, Microsoft Azure, and Google have reduced the cost of their compute instances by 36% and their storage by 65% in 2014. Those SaaS companies that host their product in the public cloud saw their costs drop dramatically. Those who purchased servers did not. 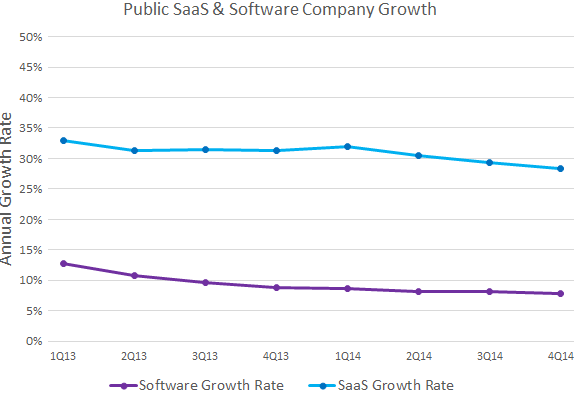 The chart on the right shows the areas where aggressive competition have reduced hosting costs of SaaS companies in 2013. Investors now understand how to assess SaaS finances beyond simple Income Statements (see Four Metrics to Assess a SaaS Business). Investors look beyond the sold product sale based financial analysis to assess the SaaS vendor’s financial strength. They look at the value of the future revenue stream not included in the financial statements, not just the last quarter’s profit and loss, to assess the financial prospects of SaaS companies. The long term profit potential for fast growing SaaS companies is now well understood with more sophisticated analysis of the increases in the SaaS companies’ Customer Lifetime Value and cash flow. Investors also highly value the long term revenue stability that a SaaS revenue stream provides. SaaS companies have lower revenues than product sales companies marketing to the same companies with comparable solutions until the recurring revenue stream builds up to exceed the value of discrete sales. Product companies that shift to SaaS have reduced revenue and cash flows until sufficient SaaS revenue builds up to exceed that of their product sales. But investors now understand this and rewards the transition to SaaS even with a short term drop in profits and revenues. Adobe transitioned its Creative Cloud Suite to a SaaS model in May of 2013. Despite an 8% decline of overall revenue, but with a near doubling of SaaS revenue, Adobe stock soared 55% in 2013. Investors is constantly looking for the next big thing. SaaS models are increasingly demanded by companies that want the advantages of subscribing rather than buying. This rapid market shift is driving the much higher revenue growth for SaaS companies than product companies. This growth in revenue, the predictability of a large recurring revenue stream, and the ability to garner more revenue over the life of a customer with SaaS versus product revenue accounts for Investors’ love of SaaS companies.